AROUND & ABOUT JUNE , JULY & AUGUST 2015. 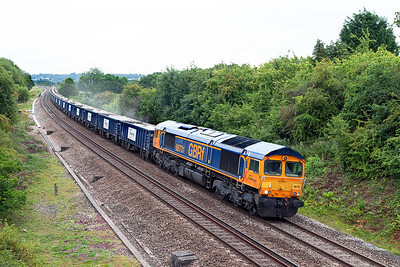 66739 'Bluebell Railway' has charge of 6V45 04.05 Tonbridge West Yard to Avonmouth West Wharf empty stone boxes passing Ram Hill. Tuesday 11th August 2015. 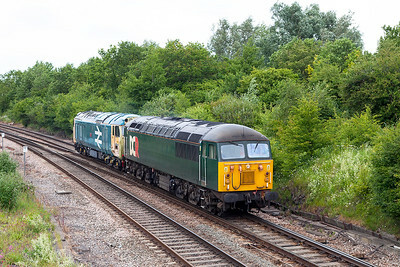 DCR's 56303 drags 50021 "Rodney' past Filton Abbey Wood running as 0Y56 Derby to Eastleigh Works via a layover at Taunton. Sunday 28th June 2015. 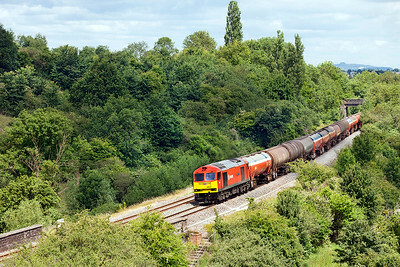 70002 approaches Wickwar with 4V06 08.52 Rugeley Power Station to Stoke Gifford empty hoppers. Tuesday 23rd June 2015. 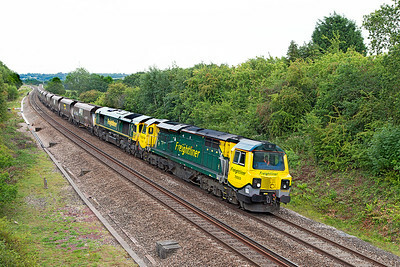 66731 'interhuGB' leans to the curve at Ram Hill with 6V80 03.56 West Burton Power Station to Portbury Docks loaded gypsum. Tuesday 11th August 2015. 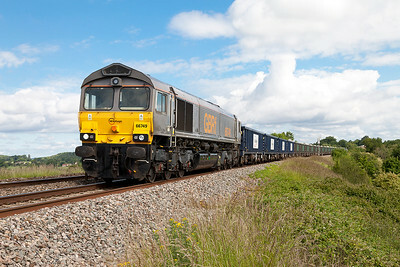 Ex Euro Class 66, 66749 slows for Charfield Loop with 6V80 03.56 West Burton Power Station to Portbury Dock loaded gypsum boxes. Tuesday 23rd June 2015. 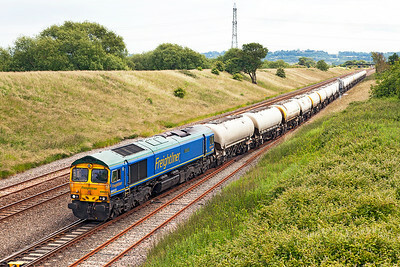 66623 'Bill Bolsover' departs from Pilning Down Loop with 6M36 12.20 Westbury Lafarge to Tunstead Sidings empty Cement. Friday 26th June 2015. 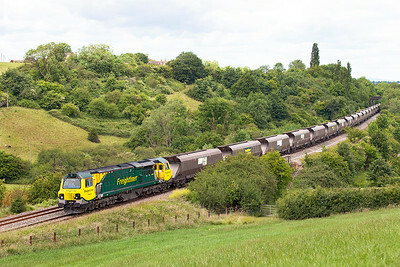 70003 has 66597 'Viridor' DIT on 4V06 08.52 Rugeley Power Station to Stoke Gifford Yard empty hoppers passing Ram Hill. Tuesday 11th August 2015. 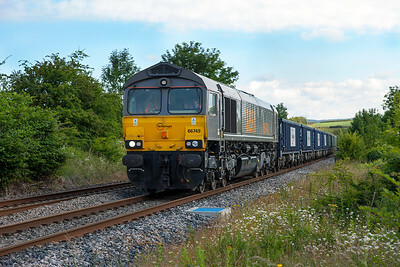 Ex Euro Class 66, 66749 having departed Charfield Loop is about to enter Wickwar Tunnel with 6V80 03.56 West Burton Power Station to Portbury Dock loaded gypsum boxes. Tuesday 23rd June 2015. 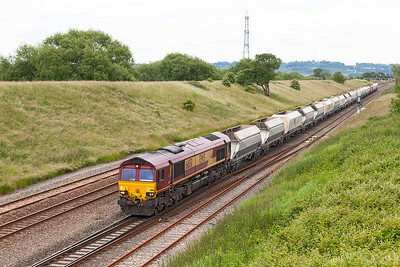 66151 drops down Pilning Bank with 6B35 10.47 Hayes & Harlington Tarmac Sidings to Moreton-on-Lugg empty hoppers. Friday 26th June 2015. 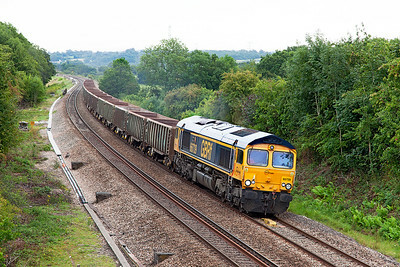 66568 passes the site of Coalpit Heath station at Ram Hill with 4L31 09.28 Bristol Freightliner Terminal to Felixstowe North Freightliner Terminal. Diverted via the Badminton route due to the engineering works at Box Tunnel. Tuesday 11th August 2015. 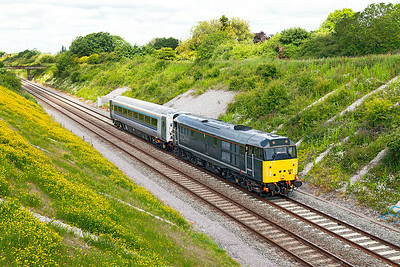 31601 'Devon Diesel Society' returns Chiltern Mainline MK3 Coach 12619 from refurbishment at Bristol Barton Hill to Wembley Depot passing Chipping Sodbury. Tuesday 23rd June 2015. 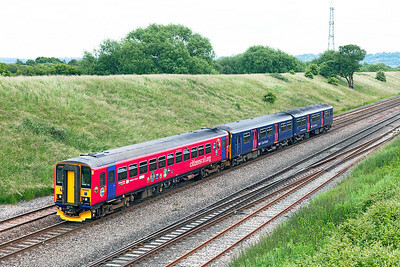 153325 in "citizensrail.org" livery brings up the rear of 2C79 14.00 Cardiff Central to Taunton. Friday 26th June 2015. 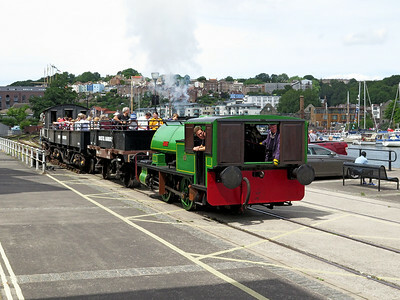 Port of Par saddle tank 'Judy' works a service on Bristol Harbour side during the Harbour Festival. Saturday 18th July 2015. 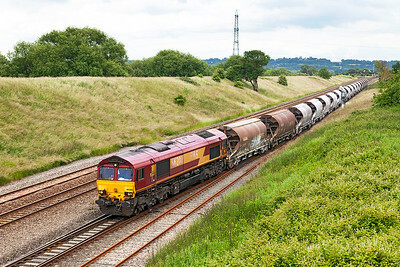 60024 'Clitheroe Castle' approaches Wickwar with 6B13 05.00 Robeston to Westerleigh loaded Murco tanks. Tuesday 23rd June 2015. 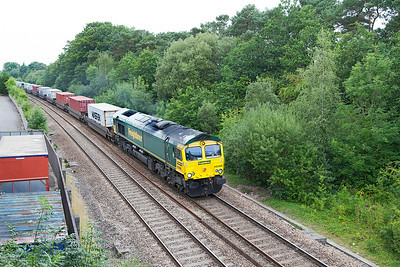 6B53 FO Exeter Riverside to Alexander Dock Junction loaded China Clay normally runs in the early hours of the morning but today ran in an afterrnoon slot with a vert tatty 66200 in charge leaving Pilning Loop. Friday 26th JUne 2015.